As well as the distribution systems with proportioning valves or manually operated coupling stations described in Issue 33 (K-Zeitung 6/2016), automated material changes can also be performed. In this case, the installation of a two-component material proportioning valve, also called simply proportioning valve, is recommended. However, proportioning valves do not replace a dosing unit. Proportioning valves have one material inlet each for virgin material and regrind, as well as an outlet to the material loader. Depending on the design, pneumatic flaps or pistons, for example, open or close the material inlets alternatively. According to the frequency the inlets are switched, the material loader is filled in layers. Ideally, these layers mix while the material flows out of the material loader. Normally the proportion of regrind to virgin material and the number of batches per conveying cycle can be set via the controls. When doing this, however, one must bear in mind that the settings are in proportionate conveying times and not in absolute material portions. Setting up a central material supply for multiple processing machines with different materials is far more complex. In this case one must decide between manual and automatic material distribution systems. Depending on how willing one is to invest, either a manually operated coupling station or a fully automatic material distribution system should be considered. The cost efficient option for flexible material supply is a manual coupling station. The set-up is comparably simple: Fixed material feed lines (source) are connected, usually from below, with the couplings on a coupling table. Flexible material feed lines hang from above, which are fixed on the other end to the pipes leading to the machines (destination). At the free end is a coupling which can be coupled with the counterpart at the coupling station, as required. For the simplest version, the couplings are not coded. This means the source-destination allocation is not monitored. The coupling of the flexible pipes with the required material feed line is carried out manually by the operating staff. But this provides the biggest danger of faulty operation due to mixed-up material feed lines. This risk can be eliminated with the use of a monitored coupling station. 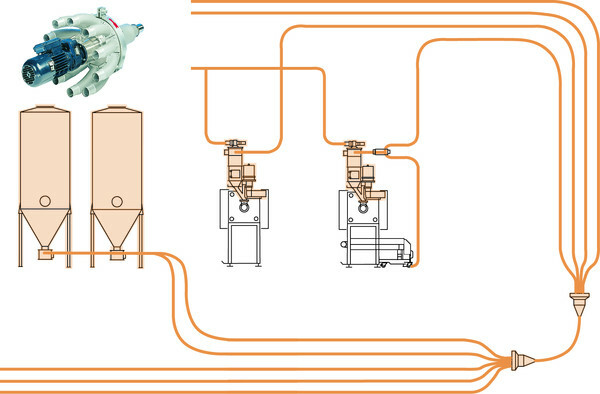 In this case, the controls check whether the conveying line to the machine is connected to the correct material feed line and only then allows the conveying process to occur. An additional advantage of the coupling stations to the low investment costs is the flexibility. If required, multiple coupling stations can also be combined with each other.